I boarded the bus to head back to my hotel and it just so happened that something at the back of the bus was not secured properly. It sounded like an loose piece metal panel that when the bus is idling say, at a bus stop or at a traffic light, the vibrations rattled the panel very very noisily. The loudness of the racket was very bad but I was so caught up with my ebook (Part 3 of the Thrawn Trilogy) that I just sat there ignoring the din. In fact, it was so bad that everyone got off the bus to take the next one as the rat-tat-tat of the metal was unbearable. Then this fella seated in front of me decided to stick his fingers into his ear as he attempted to ride the bus all the way to his destination. 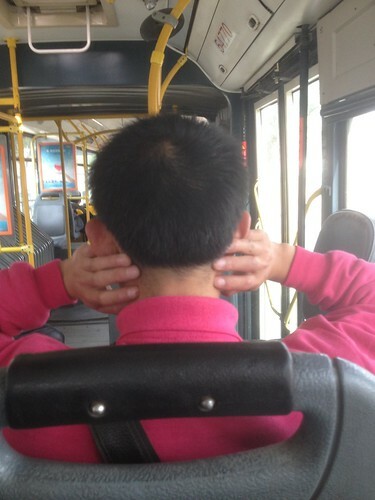 I took a photo of him, thinking there is nobody else in the bus. I was wrong. I later realised (and I supposed I was caught red handed) there was a girl seat at the last row behind me and she was doing the exact same thing as the guy in front. Elbows up. Fingers in ears. About a couple of stops later, the bus driver decided that his bendy bus, as a result of the incessant noise, was to be declared out of service and we all got booted out of the bus halfway through our journey. It was an awkward silence for the three of us, stranded at the bus stop waiting for the next one. Arrenn: Indeed! The next bus came by shortly within 10 minutes. Had it not be a super sunny day, we would have been more miserable in the cold temperature. 'I sounded like an loose piece metal panel' What talking is you, bro?? ?